The Event Information page displays real-time information about your event. This information is intended to help you get the most out of your events by understanding how your attendees interact with the site. On this page you are able to review your event details, view your event page URL, and access the event ticket scanner. You are provided with a summary of how many tickets have been sold and how much revenue your event has generated, along with details about each ticket sale. Buyer and attendee reports are available so you get even more information. To access the Event Information page, click the Manage Events link at the top of the page. This will bring up a list of your events. Clicking the name of an event or clicking the Information link in the row next to an event name will take you to the Event Information page for that event. Event URL: The Event URL shows your current event URL. If you click on the link you will be taken to your event page. You can copy and paste this URL into emails or messages on social media to encourage people to visit your event page and purchase tickets. You can change the default event URL on the Customize page. Event Ticket Scanner: Clicking the Event Ticket Scanner link takes you to the redemption page where you can input ticket numbers when attendees arrive at your event. You can also scan the 2D or QR Code provided on each ticket to track attendance. You can find more details about this feature on the Ticket Scanning Help page. Time to Event: The Time to Event field is a real-time display of the time remaining until your event is scheduled to begin. Tickets Sold: The Tickets Sold field is a real-time display of the number of tickets sold out of the total number of tickets available. Revenue: The Revenue field is a real-time display of the total amount of money you've made from ticket sales to date. The Order Summary offers detailed information about each ticket order your event has received, including the date of purchase, the buyer's name, how many tickets were sold in the order, and the order total. You can sort out your ticket orders by either the date of sale or the buyer's name. To sort by date of sale, click the Sold On heading to sort out orders in chronological order. Click the heading again to sort in reverse chronological order. To sort by buyer's name, click the Buyer Name heading to sort out orders alphabetically by last name. Click the heading again to sort in reverse alphabetical order. To see more details about the content of any particular order, click the expansion arrow next to it. Ticket information in the order summary is listed by Ticket Type, and includes the quantity of tickets purchased, ticket price, fees, and revenue. If you set up Attendee Information on the Customize screen, you can view the information collected by clicking the circle icon with the person inside of it, located to the right of the expansion arrow. 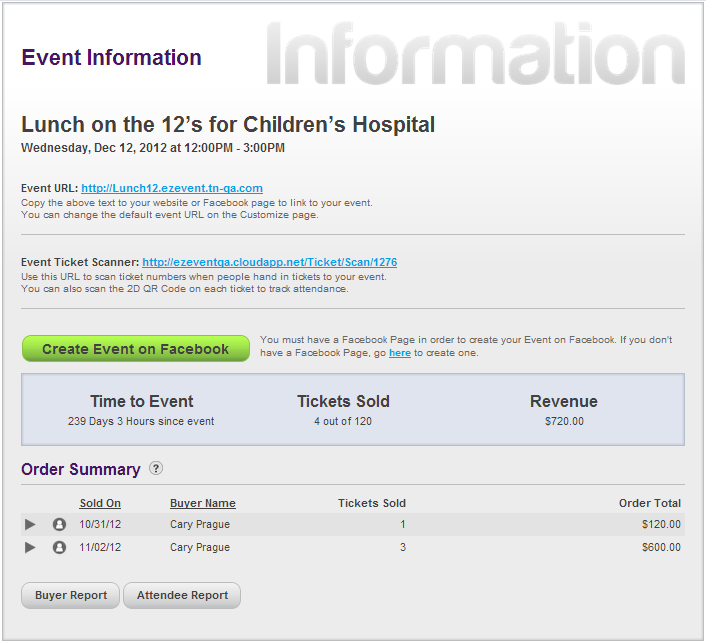 The order summary provides you with information on the Ticket Type purchases, attendee name, and email address. Clicking the Edit Attendees link launches the Add/Edit Attendee Information page so that you can modify the provided information if necessary. At the bottom of the Event Information page you will find a Buyer Report button. Clicking this button will take you to a Buyer Report that has detailed information about each order, including Order Date, Buyer Name, Buyer Email, Ticket Summary, Order Total, and Order Page. If you have used the Attendee Information advanced feature, there will be an Attendee Report button to the right of the Buyer Report button. Clicking this button will take you to an Attendee Report that has detailed information about each attendee, including Ticket Type and Ticket Number, and any additional information you chose to include on the Customize page for Attendee Information. If you have used the Participant/Pledge Form advanced feature, there will be a Pledge Report button to the right of either the Buyer Report or Attendee Report button. Clicking this button will take you to a Pledge Report that has detailed information about each attendee, including the Order Date, Participant Name, Participant Email, Order Total, and Order Page. For more in depth information about Reporting, please visit the Reporting Help section of the Help Center.